Most teachers have had a student who comes to class already angry, seemingly at the teacher and his classmates, and no matter how hard we try, this student will not talk to us about it. Maybe he talks back to the teacher, refuses to do his work, or seems not to care about any consequences he might face for his behavior. It breaks our heart when this happens. We want to reach him and help him realize he is safe here. We want him to know he is loved and cherished and valuable. We also need to teach him. As a music teacher, we only see this student for an hour a week (or less). How do we build a rapport with him so he will trust us while also teaching the lesson? That is the struggle. I teach my kids from kindergarten up through fourth grade, so if they come when they're little, it seems pretty easy to build a rapport with them. I'm a naturally light-hearted teacher who enjoys playing silly games while I teach, and I give lots of hugs and listen to lots of stories, so the little ones love me pretty easily. We build a history together. As they get older, I can remind them about fun things we did together - musicals, Christmas caroling, kindergarten graduation, fun games, campfire songs, etc. This multi-year history is so important in building a rapport with students you don't see every day. But when I get a new student in third or fourth grade, we don't have that history. With most students, this missing history isn't a big problem. I talk to them a little in class to get to know them, and I try to talk to them in the hall whenever I see them. That is enough for most kids to relax and enjoy music class in the upper elementary grades. 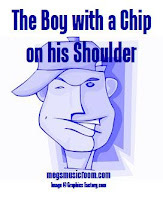 However, for the boy with a chip on his shoulder, this is not enough. He doesn't have the years of experience that tell him I don't get angry, I don't yell, I don't embarrass students. His reaction when he comes to my class is to smirk at every instruction, talk back after any correction, and try to collect followers who will join him in the smirking and talking back. I have realized that this student is going to need to build a history with me quickly in order to relax. So here is my idea to help build a rapport with this student: I need to spend time with him in an environment that he sees as non-threatening. Music class is not that place yet, so I was thinking lunch time. What if I held a "Get to Know You Lunch" for all the new fourth graders and the specialist teachers (P.E., Art, Science, Library, Music)? It could be once a quarter, once a month, or even once a week if it was necessary to build the rapport quickly. Since students love eating with teachers and seeing their more relaxed side, he would likely see this as a reward. And I'm thinking that, by inviting all new 4th graders, he wouldn't feel singled out for something negative. He would realize he wasn't the only "new kid." He would have a chance to see that all of the specialist teachers are pretty fun, and maybe that would eventually lead to trust. I don't know if this will work, but I'm willing to give it a try. It's not that much extra effort, and if it positively affects my kids, it would definitely be worth it. 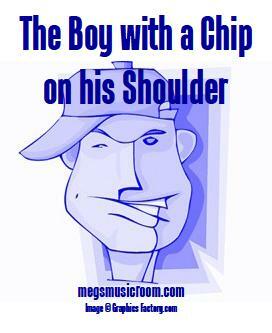 Do you have any ideas for building rapport with "the boy with a chip on his shoulder?" Share below! I'd love to hear your thoughts! Beethoven Trivia Game - POWERPOINT VERSION!!! © Megan Heikkila. Travel theme. Theme images by sebastian-julian. Powered by Blogger.